On Thursday, May 21, 2015, school activity was quite different. There was a sense of worry, fear, and anxiety in the faces of the parents who dropped their children in school. Unusually, they come to school late afternoon. The children (4-6 years old) would follow Super Camp at school. The afternoon activities were playing games, later they enjoyed 'afternoon snack time'! The Children were given a cup of hot sweet tea and fried bananas made by school chef. All looked hungrily, ate the snack that was served. After the stomach filled, the evening call to prayer rang out. The children got ready for the evening prayer in the school hall. When ablution, they lined up. Once ready in rows of prayer, the teacher pointed to a child who would do the azan and iqamat. After that, they all read Asmaul Husna while viewing video about Asmaul Husna. Shortly after, the call to prayer Isha sounded. And they're ready to do Isha prayer and prepare to have dinner. The dinner was with a buffet concept, requires children to take their own food that has been provided; vegetable chicken soup and crackers. The children would queue up and take the food. They ate in front of the class corridor. Ritual before meals; singing a song before a meal, washing hands and praying, after that the children ate the food that they took by themselves. Once the stomach filled, children immediately gathered around a campfire. After all, then the bonfire lit and how amazement implied in the children's faces when they saw the fire. Sausage that has been pricked was prepared for roasting over a campfire. Each child tried it. All the children tried to burn the sausages on a campfire. After that, it was time to eat the sausages. It's a beautiful night, the stars also seemed to smile decorating the sky. The star sparkles. What a great campfire. 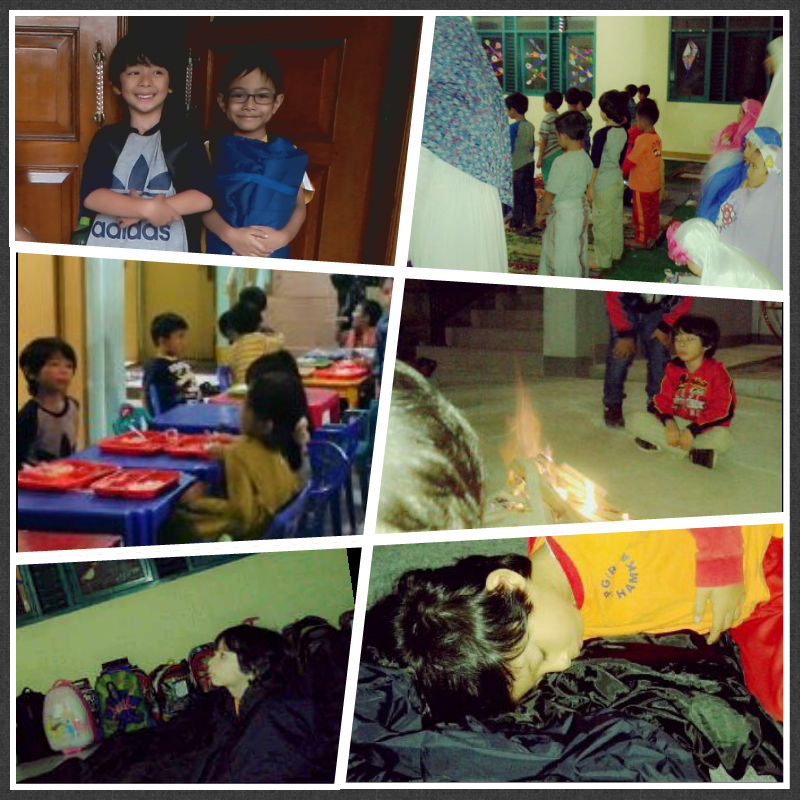 Last activity, before sleeping, the children brushed their teeth and got dressed with pajamas. After that they all get to sleep inside their sleeping bag. In the next morning they woke up and did Subuh prayers. Then they had breakfast and exercise. After all completed. Children were ready to be picked up by the parents. Super camp indeed...We haven't enrolled our kids to similar ones. They have summer camps as well here..but a bit different from what you got there.. Camping always gives the kids unforgettable experience. They must be really excited and happy to follow and join all the camp games and the campfire as well. Yup, mak. It was different from what you got there esp. the camp activities. 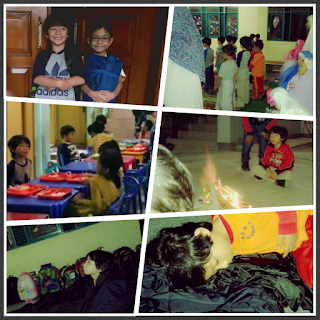 hihihi Here, in Vito's school, the kids didn't sleep inside the tent.